Is it a Staph Infection or Herpes? What’s the Difference? If you’ve ever woken up to red bumps on your body, you might assume you either have a staph infection or herpes. Based on looks alone, these two common viruses are difficult to distinguish — which can oftentimes lead to misdiagnosis and potentially risk your ability to fight off infection. Staph vs. Herpes: What’s the Difference? Though they may appear the same, staph infections and herpes are two very different infections. 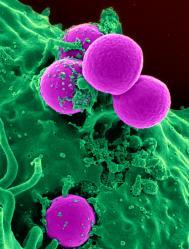 Staph infections are bacterial in nature, caused by Staphylococcusaureus, which is how it got its name. The foot is the most prone area to pick up bacteria from open wounds. An important sign to look for infection is a yellowish crust on the skin. One common type of staph infection is known as cellulitis, which infects deeper layers of the skin. Though it can be treatable with antibiotics, those with diabetes or weak immune systems are more likely to develop this infection. The appearance of the staph bacteria on the skin can range from red bumps to flesh-eating infections, depending on how strong the infection is and how deep it is in your skin. Herpes comes from two strains of the herpes simplex virus, Type-1 and Type-2, that can infect an individual. Herpes simplex type-1 (HSV-1) can be acquired as early as infancy when infected individuals spread the disease from direct skin-to-skin contact (regardless of whether they are experiencing an outbreak or not) from activities, such as kissing or sharing a utensil. Signs and symptoms of herpes are quite similar to staph infections in appearance and symptoms. However, there are other signs, such as having problems urinating, that may indicate that you may have contracted herpes instead. The symptoms of both herpes and staph infection can range from irritation to severe pain, don’t suffer through it — let the medical professionals at FastMed help you diagnose and treat your pain. We’re available across North Carolina and Arizona to help 365 days a year. Visit one of our convenient locations today!